Margaret Harris Fine Art Awards for excellence in Fine Art Sojie 3 and the 1st Place Traditional SOLO pentru lucrarea “Elegie” din seria “Soapte” – mai 2010. The mood that Dorina’s art evokes is enigmatic. It present a certain peace and calm despite the storm. There is a feminine strength that extends beyond the canvas with the power to change the atmosphere. The facial expressions and haunting depth she infuses into the eyes of her subjects demonstrate the dynamics of woman’s loss of innocence and quest to succeed despite her obstacles. There is a grace present in her art that is absent of sickly-sweetness, and a courage that rises above the title of victim. All of these qualities, as they blend together, infuse her art with a romantic sense of hope and promise – the romantic sense translating as a dream-filled heart that never ceases to believe. Through the magic of electronic exposure, Dorina has managed to gain an international following. 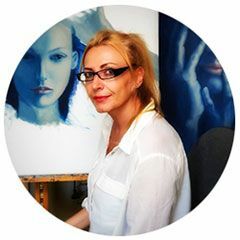 It’s encouraging and exciting to stroll through her internet portofolios and see how well recognized and received her art is amongst art lovers, and even more exciting to see how diligent she is in showing her gratitude and appreciation to these followers – despite the language barriers she has to navigate in order to do so.